The Falling Leaves Shop hop is just around the corner – September 29th – October 7th. Seven great shops. Seven “free” patterns…..seven “free” fat quarters! This the a favorite you don’t want to miss. Each shop will be providing a demo to get you energized as winter approaches and we’ll have lots of time inside. This year all seven “free” fat quarters are incorporated into a pattern you will receive when you complete the hop. 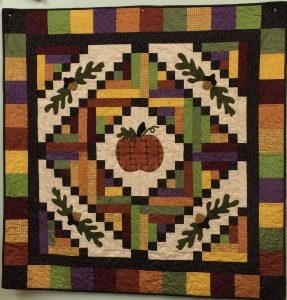 All shops have finished their quilt differently and you will also receive a “free” pattern from each shop you visit incorporating the fat quarter you received from their shop in a separate smaller project if you don’t want to make a larger quilt. There will be drawings for Gift Baskets ($100 value from each shop) and Gift Certificates ($100 value to seven individuals who complete the shop and names are drawn). Hours of the hop are 9:30-5 Monday through Saturday and we’re all open 12-3 on Sunday, October 1st. The latest and hottest selling book is the “Big Book of Table Toppers”. 56 Patterns! They’re flying off the shelf and we’re going to start a monthly “topper” class and kicking it off with the first topper class scheduled for September 28th. Contact the shop to sign up if you’re interested. There is no cost for the class….you can bring your own fabrics (although we have kits) but you do need to purchase a book. Next class will be in October for another project the class selects. This year our project for the W.C.A.H.S. (Animal shelter) are quilted pocketed potholders holding a spatula and laminated recipe card. There are four classes scheduled. And the Holiday Luncheon to follow will again be held at Pine Brook Farm for a fondue lunch! Cost is $35. Limited to the first 45 who sign up. Contact the shop for more information. These potholders are really cute. I have a few made up at the shop. And the Animal Shelter has planned their Holiday Tree of Light program again this year at Spooner Market and Grill. If you missed it last year, you know you missed a really great event. It will be held on Thursday, November 30th. There will be more information coming but make sure you schedule this evening open and call some friends. Enjoy your week. Stop in when you get a chance.